The other day, I had Darshan with Amma. It was delicious because it was filled with laughter…laughter mixed with love. Amma is a woman, some say a saint, who has given her life to selfless service. She has created a global web of humanitarian services that are empowering women, feeding children, and responding to the immediate needs of millions of people affected by both natural and man-made disasters. And, every day of her life, she spends hours giving Darshan to those who come to receive it. Darshan is a Sanskrit and Hindu term meaning sight (in the sense of an instance of seeing something or somebody), vision, apparition, or a glimpse. It can also mean to experience a realized Being, one such as Amma. During her Darshans, Amma hugs you. You kneel down into her lap, and she hugs you. Now, this isn’t just a hug, it is a HUG. Everyone’s experience with Amma is different. Usually, I am simply filled with love. The other day, it was a hug filled with laughter. As the woman ahead of me was receiving her Darshan, another woman brought a baby over to Amma and the baby began to laugh. Amma laughed. The baby laughed. Amma laughed. They began to just grin at each other, and I was kneeling right in front of the whole shebang as it unfolded. I just watched the playfullness of the baby, mirrored in the playfullness of Amma. You know how laughter is contagious? Well, the virus began to spread. I reached in for my hug and as Amma hugged me, she was still laughing. I could feel her entire body moving as she heartily laughed. I mean REALLY laughed. And, she has this deep, earthy laugh that makes it all the more compelling. My entire body began to laugh, too. I experienced sheer delight as I was held in the arms of this incredibly strong and lovingly compassionate woman. This past week, I also spent time with my granddaughter Aveline, and my niece’s twins, Eli and Hannah. Again, laughter. So much laughter at the sweetest things, the simplest things, the most unexpected things. Bugs. Berries. Peek-A-Boo. Dancing when there was no music to be found. Dancing at the drop of a note. Fascination with the littlest details I pass over every day. Aveline is twenty-one months old, and Hannah and Eli are twenty-months. There is a wonder and curiosity at this age that is totally contagious. With babies and children, one moment there’s laughter, and in the next, crocodile tears; one moment there’s amazement and wonder, and in the next, the need for a generous, big mama hug. These babies in my life are always giving Darshan. Laughter, delight and amazement are qualities of the feminine aspect of life, qualities always available to us all, when we step out of our analytical minds and into the graces of the heart. From here, we can see, know, feel and touch things we miss in the ‘figuring-it-all-out’ places of the mind. Life is full of so much turmoil right now. And yet, wonder and curiosity, hugs and amazement, love, laughter and delight are here, too. Just maybe, we might find a way out of all these seemingly intractable problems by remembering the innate, spontaneous movement of love that appears when we remember our own innocence and listen for that which caused the rose to laugh in full-blown beauty. Life is always offering Darshan. Are we curious enough and open to receiving it? What Darshan have you received lately? From life? From children? From who knows where? This post is part of Dian Reid‘s blog challenge at Authentic Realities. 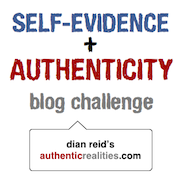 Check our Dian’s blog challenge to learn about discover other bloggers writing about Self-Evidence and Authenticity. 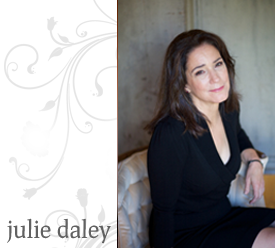 Oh Julie, this is beautiful! I’m THERE with you – in the hug – you made it so real and so NOW! And the baby giggles too – thanks!! I feel so blessed to be reading this. Just what I needed at this very moment. Some laughter that comes from a smile at knowing deep within, exactly what you’re talking about. Even now as I type, I find my eyes filled with tears of joy, I can’t quite explain it…but, oh what beauty there is in this laughter you’ve filled us with, simply by sharing your experience. I love you that you, your blog, your words, your experience are now a part of mine. check out my religious preference on facebook: laughter. yep, my religion is laughter. and i couldn’t have explained why more beautifully than you have here. Hot tears are rolling down my face, Julie. You have articulated what I have been feeling but could not say. I used to think that my feminine qualities were liabilities. Thank you for expressing this. Some days, I feel completely overwhelmed and alone. Nice to be reminded that there is still so much beauty around us, even in a painful world. Oh, Julie. (I think I could just stop there). This is beautiful, and I thank you for putting these words down for all of us. What a beautiful experience, I felt as if I was right there with you in the midst of all the laughter, love, and Darshan. I had Darshan with Mother Meera last year. It was quite an extraordinary experience and one that I’ve not quite fathomed out. Someone there mentioned Amma. I hadn’t heard of her before. I’d love to have Darshan with Amma – it sounds so joyous. What a wonderful experience for you. A practice of hugging? Oh my. I have so needed that. Simply stunned and intensely curious. Oh, I hope I can learn to let myself laugh like that. What an amazing experience. Oh I have wanted to experience Darshan with Amma since I heard of her. It sounds even more lovely than I imagined. And the laughter of my babe is what keeps me going on many of these tired days. Next post: What Is It To Be Female?